There is no network perimeter anymore! ¹ Free in cost only measured by time and effort. Whether we like it or not, and defending them is hard, visibility is even harder. Risk management, a risk register, a vulnerability acceptance posture. Yeah, you usually hear about this after a security incident. There are some things you can do do fortify your defences, and they don't require a business case to implement, they don't need a project manager, and they likely cost less then a coffee. Adversaries, attackers, breaches, hackers, all words familiar words in todays landscape, but its not as bad as it would appear, you can do a lot for not a lot of your time and effort, in this blog i will show two services that you can automate and remove a level of uncertaintly from your blindspots. 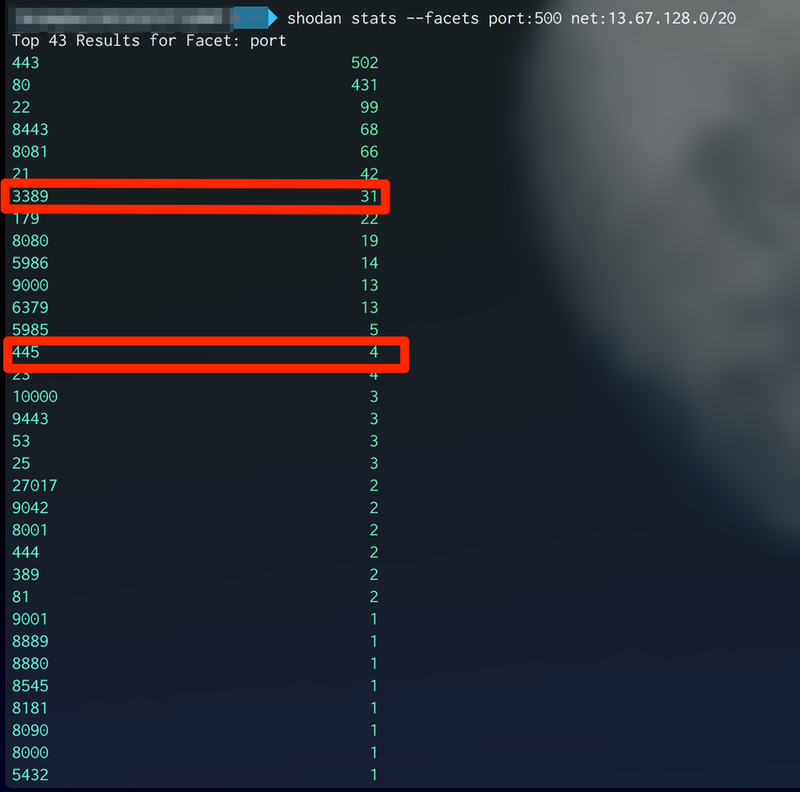 Firstly, there is 100 quality blog posts on defending your network using Shodan, and i will not try to do better than them, using my own experience and methods i'll share some ways to gain insights into how attackers use shodan to leverage a entry point, or a vulnerability. So, in our case we need to identify a subnet to monitor, John has perfectly described how to do this here but this post goes a little deeper. So, unless you're fortunate enough to never have heard of SMB or Ransomware, then you are likely going to be very bored by this set of investigative steps. This will output a total number of devices shodan can see, not very helpful so lets chop it up a little more. Cool, so lets say i was an attacker i'd be interested in the path of least resistance right? SMB, RDP, etc, fire up my metasploit, and then watch as it exploits it all for me. In my tests, the results was ZERO, so thats good news. So that is a very small step on protecting the perimeter for less than the price of a coffee, and about the same time as it would take to drink it. I've been using my own version of this tool, customised to use some more personally interesting topics such as banking, and US Political lures. You can do the same for your own company as i've done in the past with varying success, in our case we're using Microsoft. So we can just comment out all of the junk and put in the following (I recommend combining it with DNStwist) then we have a long list of likely typo domains, and some which are being used in the certificate transparency generation list. I was fortunate enough to work with some incredibly talented people in my journey into security, who helped me understand difficult concepts, some of which I am still learning. Two skills I believe are absolutely key to working in security because no matter where you go inside security you'll need an intimate understanding of both, so that's where i decided to start, i was working on user virtualistion software, this is, in essence, a reflection of roaming profiles, and using some magic to ensure a consistent user experience across all platforms, including physical and virtual desktops, not limited to stuff like published desktops from Citrix, Vmware & Microsoft. I furthered my understanding by buying a couple of books.. I probably refer to at least one of these books once a week for a function or the parameter of a service, partially because I have a terrible memory. In that role, I was automating some of the work I was doing and came across tools like psexec, sysmon and the rest of the toolkit. So like any analyst, I automated some of my testings and begun to explore the rest of the tools. Process Monitor & Explorer - thank you, Mark and Bruce! I used this to troubleshoot registry problems, identify login issues and generally understand what was happening during login. A low-level way of examining & testing bugs that I was trying to non-programmatically troubleshoot. Little did know that during the troubleshooting I would identify malware infection in my own lab, I was able to track this down using some of the inbuilt filters which captured the process running when I visited a certain site. This was the moment I knew I was interested in malware. I didn't have any idea what it was capable of but I knew how to identify it and how to remove it. I had a keen interest in attending FOR610 and joked ' i would give my first born to go', the reason was that it was super expensive. I learnt an awful lot on this course and still refer to the course materials to this day, both Lenny and his colleagues are incredibly helpful, approachable and clearly enjoy what they do. I've spent a few years at Fujitsu now and learnt more than I can possibly write down here, but some of the highlights included working alongside great people, and being fortunate enough to work at the NCSC as part of the previous Fusion Cell, and now known as Industry 100. Representing Fujitsu on a number of occasions all over the world, and attending Blackhat & DEFCON. Speaking at conferences on behalf of my employer is something i am incredibly proud to do, and something which impresses my daughter even more - which is all that matters. I have the opportunity to share what I know and have learnt. This kind of opportunity is something that gives me an incredible feeling of gratitude knowing I am assisting those who need to learn, like me I forever refer to myself as a 'noob', because when you realise you know everything, you realise you know nothing. The opportunity in question is working alongside some talented people at CTU in Prague on a project called CivilSphere working remotely to protect those vulnerable from being targeted. I have always been impressed by the work done by the likes of CitizenLab and was inspired to try and be part of this protection network. I am very thankful to Sebas for this opportunity, and all the talented people at CivilSphere. I will be leaving Fujitsu in a few weeks, to start a new role at Proofpoint. I look forward to learning more interesting concepts, and being a noob all over again. I consider myself a noob, forever asking simple questions. Just how does DNS work? WTF is a floating pointer. A lot of these questions borne out of curiosity, and a few people said they would be interested in hearing how I got into Security. So i decided to write it down, it feels very much ' LOOK AT ME HOW COOL I AM ' and self indulgent writing this, but that couldn't be further from the truth, i hate talking, or writing about myself but in light of the current state of security, and being considered a mentor to a few people and working with extremely bright people i felt obliged. I have loved computers ever since i could remember, i won't bore you to tears with my first computer because its likely the same as most people my age, but here is a photo of it. A shared computer at home, no games. Now I realized at the time a lot of letters started to appear on the signatures of my peers ( MCSE, CompTIA) I thought, what was this? a quick Yahoo! ( yes, yahoo ) a search showed me that Microsoft was giving certifications to people who took tests and with that came the letters! Cool, I thought, i was in my 20's and had not sat a test since school, and i did not go to University so it was natural to try and test myself. That particular employer did not give me any training so i had to leave and ended up at one job (i have missed out two roles here that do not have any impact on my journey into security ) - i ended up at a communications company, dealing with MPLS, leased lines, dedicated fibre links etc. Basically, the stuff that powers the internet & telephony. So at this point, i had access to an Active Directory with approx 3,00 users and mobile devices, computers which ran XP and a Windows 7 deployment upcoming. This was my job to manage, design and deploy. I was very scared. computers where something i used not something i knew what to make use of! I was extremely fortunate enough to attend a Microsoft Course which was titled ' Fast track to managing and maintaining an active directory domain 2003,' , this course 5 days away from my home in a strange city taught me so much, i had 10hrs a day exposed to an active directory domain that i build and could break and rebuild without the fear of a P45 arriving, i got further into some concepts that i had come across ( DHCP, DNS, WINS) and some other more interesting concepts which iginited my interest further. Now the grizzled amongst will say it's not, I completely disagree - the entire concept of Active directory has been badly managed, and whilst its now an entire attack surface and has brought to light some of the most incredible attack methods, there is very little in the blue team area of protecting Microsoft Active Directories. So. after dedicating a few years to becoming a specialist* in Active Directory security, i moved on. A role in the legal marketplace. I was protecting the assets of solicitors, a domain unlike any other i've ever worked in before. A difficult but challenging role because of the reliance of physical documentation for legal professionals restricted much of what is digitised. I was very boring for a few years, taking exams every few months. One day, I arrived for work and was told i would be sent on an ' intervention', this in the UK refers to a concept when a legal practice is in distress a member of the 'SRA' will intervene and take over, this included all electronic items. I was basically an IT bailiff. I had managed antivirus solutions because nobody else would (Who can blame them?) but quickly realised what a GOLDMINE of information was being identified, it was a pretty default policy ( block, allow, delete, quaratine ) the little friction it was generating was not worth the cost of renewals, so I changed it an applied it to different machines, using different policies depending on location and level of practise seniority, I didn't want to get the sack because a partner of the practice couldn't plug in the USB device he also used at home. I was identified as a potential for the intervention ' because Bryan knows security '. Did i? Not really, but I did know how dangerous office macros where and why IE6 really shouldn't be used. Let's go - anyway, an 'encrypted database' was being used to store all client data and we needed it to be able to 'take on the cases'. the 'encrypted database' was a Microsoft Access database, it was trivial to crack, made even easier by the fact the password was stored in passwords.txt in the same directory. So i was given access to be able deploy my OWN antivirus policies as a result of some good work around ' finding passwords in directories called passwords', i had shown interest so there we go. I deployed extremely restrictive policies to execs, so much they complained, i updated device controls to prevent data loss via mobile phones, and usb sticks, and identified the malware as a result of this and thought ' well this is cool', im using something someone hates to hear about to find all this bad stuff, who wouldn't be interested in this?!' Turns out it was only me, and this is where my security passion was really born. Fast forward a few months and i received an alert from my very restrictive policy alerting me to someone running passwordump.exe on my domain controller, but not only did i lay a very small egg in my pants but i was worried because the domain controller was a honeypot. I had deployed a few domain controllers in a sense that they advertised the services to a would be a attacker but contained no actual resources. A modern day RODC but RODC was a thing. Turns out we had a 'black box' pen test in which the manager was aware of, i quickly identified the pen tester in a room he had 'walked into' and plugged into a telephone port, identified the DHCP range as being broadcast from my 'domain controller' and thats all - i just named the server as DOMAIN CONTROLLER and no ntds.dit was enough to attract the attention of his toolkit. The server was only running DHCP. Anyway i tried to take control of his session, and this image made it into the eventual pen test report as a way of positive feedback on deception. As I've written here I have realised a second part will be much more interesting than one long boring post. It will include more of the recent stuff, a failed CISSP study attempt, how I identified bugs before bug bounties were cool & some malware stuff. Panel party - Loki, Pony. Hunting via Hybrid Analysis I identified persistent offender(s) storing content on a panel. I kept my eye on it for a while, and when it was busy enough, I managed to get the entire server configuration panels. The most interesting thing for was that Loki has a POS module. The below is collection of the some of the recent samples collected from Swiss campaigns targeting OSX victims. I've just uploaded one single sample for researchers to analyse, however, Apple is actively investigating the misuse of these certificates. Retefe and OSX.DOK - One and the same? A few vendors announced a malware family known as OSX.Dok which targeted OSX, using strikingly similar methods that i had seen used by Retefe, having observed some of the configuration changes recently, this seemed too similar to be a simple coincidence. For those unfamiliar, Retefe is a trojan, and numerous configurations exist which usually target most EU banks. The United Kingdom, and France but a real target in my own experience has been Germany and Switzerland. This article last week identified Germany but included a Swiss screenshot by Checkpoint here so slightly confusing. The part of Retefe which struck me as similar included the proxy .JS file for the trojan to identify the range of banking sites it wants to intercept. Banking trojans have been at the forefront of media for a while, and the revenue they generate are clearly attractive to criminals and to law enforcement as demonstrated recently both here and here. From Russia with love, another week another RAT for sale on the usual forums. Steam stealer and usual supposedly FUD builder and Android RAT. John Matherly originally wrote about this in 2015 This entry has since been resurrected and will no doubt be again resurrected in another 12 months. A significant media outlet are taking note in this extortion practice and for me, whilst painful for the victims this is simply part of the stratagems associated with online survival. So, with this in mind. Let's take a look at the data currently available as of 05/01/17. Data will be redacted, I don't want the responsibility of dealing with the consequences if they are eventually extorted. The thriving carding forums that reside under most .ru domains or .su offer a significant amount of diverse fraud options, ranging from simple carding fraud from dumps or CVV dumps. I had identified, ' The Money Team' by way of their preference for offering what is known as pink slips. Offering a substantial amount of documentation via a DNM for the following prices, which are competitively priced based upon a sliding scale depending on amount purchased. IE: more slips, the cost goes down. As a potential buyer of the documents you can request a sample, a reputation as a buyer is required, and if you're feeling adventurous you can ask for a courier such as SDEK/DIMEX/CSE. I will be paying close attention to what other services pop up from TMT. A year in security is a considerable amount of time, the amount of breaches, attacks and disclosures have been almost non stop and we're not finished yet. I have listed below some of the most notable 'cyber' incidents which caught my eye for a number of reasons. No real surprises for those in the trenches of security, I've missed out some of the more 'media' friendly stories as cyber became front page news this year, with every DDOS and breach impacting those who have zero idea how the incident will have occurred. Typically cloudy responses from the organisations affected do not help the affected, or more importantly the victims. What are companies doing to ensure this doesn't happen to them? The basics, the advanced intelligence led security endeavours to look for the potential attack vectors and methods being used elsewhere, and deriving the intelligence from them, but the fact is most attacks are NOT sophisticated. This phrase is only tagged onto those incidents that make front page news, or as i call them the BBC factor. I am a big fan of @thegruqg for one his clarity in tone for security along with his razor wit is good to see in security, he is a poster boy for security snark and backs it up with proof. OPM breach - ignorance of the clear threats and lack of understanding from top to bottom, which resulted in the Oversight report and the person at the top losing her job. 3.Companies threatening security researchers for disclosures. Dridex, Dridex. The bane of so many people's lives. My included. Has been 'quiet', i made a post in the hope it had gone away. It had not. It has returned with a couple of new Botnet ID's, 144 and another 1024 which i am still working on. Includes a list of interesting targets. From the sample Matt posted and the one i was analysing, included a comprehensive list of commercial banking applications, and also an improved list of enterprise applications. List is here see the comments for the full list. Incidentally, Dridex has historically been delivered by an macro enabled document, Microsoft recently backported a good solution to blocking these from downloading malicious payloads using this - https://support.microsoft.com/en-us/kb/3115427 but it was exclusive to Office 2016. Thankfully, it's now in Office 2013! Please install this patch ASAP. Tools of the trade: An intro. 2. The screen is amazing, and my eyesight is getting progressively worse. I outputted a list of my tools and was surprised at just how much i had customised my device. KnockKnock from Patrick Wardle, along with a lot of other tools are available here "KnockKnock... Who's There?" See what's persistently installed on your Mac. KnockKnock uncovers persistently installed software in order to generically reveal malware. Little Snitch - Essentially a firewall, but offers usability. Hopper - Disassembler for x86/x64 RE - Not free. Radare - Another disassembler, my personal preference. Brew - It's amazing OSX comes without half these tools, but you'll quickly realised you need them. Shodan command line - As above, really is part of everything i do. Olevba - Excellent parsing for OLE files, usually MSOffice. N O T E : this is for beginners, as a more seasoned security researcher you're probably used to seeing these tools and probably shouldn't be reading this. This particular comment struck me because in early may i was analysing some malicious .pps documents i had received and identified a number of CVE's being used in them, they contained material related to the Government projects and political interests in SE Asia. I was struggling to identify what type of campaign this was, when i identified some of the C2 commands were being stored in blog comments on legitimate web sites although they were completely unrelated to any political activity. There is a lot of security research available in the political unrest of SE Asia, South China Sea. A lot of the content available to research has been laid by FireEye the ongoing territorial disputes are being fought with a very competitive cyber theme. We will no doubt shortly see some official word on the 'takedown' of Dridex and/or Locky, it has been widely reported that the lack of daily spam campaigns indicates its disappearance is linked to the FSB operation. Its widely known that the FSB only get involved in cyber criminal activity when there is significant international pressure to investigate. It's difficult not to draw logical conclusions on the timings of the two operations and subsequent disappearance of Dridex/Locky but its unlikely that Russia would be directly involved in a 'takedown' operation of a significant botnet which was responsible for the theft of money from banking institutions. 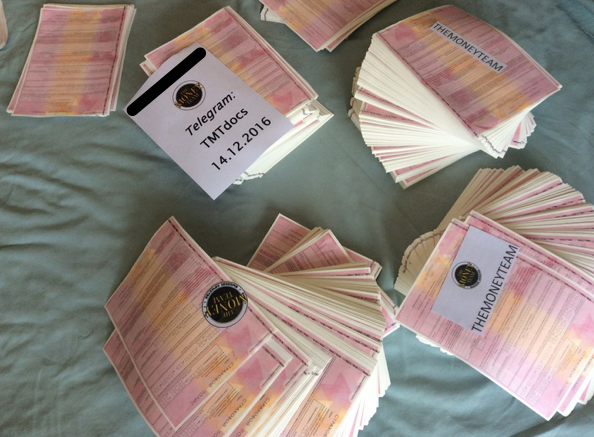 FSB & MIA worked with Sberbank to conduct this operation and the reports from Russian intelligence indicate around 2.2 billion rubles where lost between October 2015 to March 2016 which ironically is the same time of the Smilex arrest who at the time was in Cyprus, originally from Moldova. Identifying Hancitor was done by post infection in my lab - Thanks to Matt as ever. @Bry_Campbell the /sl/gate.php is Hancitor, while the /zapoy/gate.php is Pony. Powershell, and the attacks it is capable of is not a new concept. The number of publically available frameworks are growing exponentially. It's a trusted method of attack and one that is gaining more and more focus from those capable of leveraging its Power. It's probably present on every single machine in your enterprise. It's a native tool which is difficult to detect if used in an attack. It leaves very, very little in terms of forensic evidence on either endpoint, or if moving laterally across a network. There are probably 10 more reasons to worry about Powershell, these are just ones i'm familiar with. I first begun using PowerShell to perform very mundane tasks that should be automated such as the creation of user accounts, the deletion of user accounts etc. I then found out that Microsoft was releasing a version of Windows which was a command line with no GUI. This effectively means you can manage it via command line and subsequently remotely. This did exist before, but the functionality used in R2 was far greater than it was. No. There is nobody here. Server Core, the version which i begun to use in place of the full blown GUI version was easy, i was able to configure Windows RM using sconfig. I then begun to use Powershell in a way which made me understand just how powerful it was. I'm no script ninja, i am able to write scripts which help me do work in a faster, more agile way. Then i discovered this Get-wmiobject i realised was able to use WMI classes which as far as i remember was the single most dangerous thing i'd seen on a network, barring physical access to a comms room. Why? Well, WMI is essentially a remote management framework, you can do the worst thing possible on an endpoint - Execute code. I hope this sufficiently conveys the capability of it? Further to this, a lot of very smart people are already doing fantastic work in this place. In no order whatsoever. I would recommend following, and keeping an eye on their work very closely. If you need to defend against these kinds of attacks, the work done by Sean is available here. Some very public breaches have contained links to the potential usage of these tools if you still needed convincing. The hackers behind the attack on infidelity website Ashley Madison alerted staff to the breach by setting their laptops to play AC/DC song 'Thunderstruck'. The following is a code snippet available from Powershell Empire..
'Description': ("Play's a hidden version of AC/DC's Thunderstruck video while "
Thanks to all those named above for the work they are doing in this area.